August is here and the countdown to the first day of school has officially started. You probably have one of two types of kiddos at this point. Those who are ready to go back to school, or those who want summer to last forever. Regardless of what point your child is at, this super fun Race to the 1st Day of School will help get him ready to go. 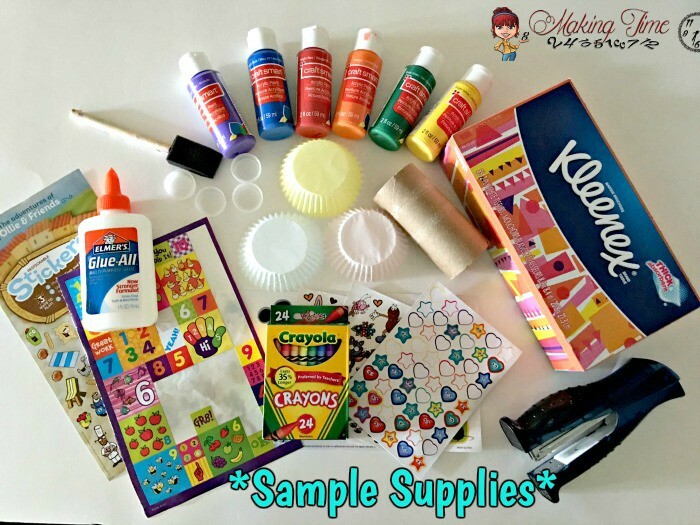 It’s an easy craft and makes sure your child is ready for his first day. 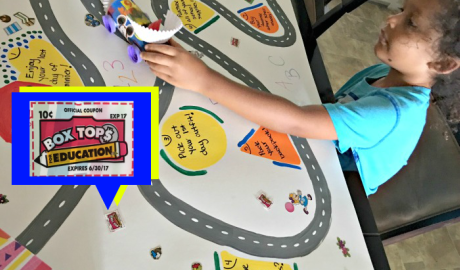 With accomplishing everything from packing his backpack, picking out his first day outfit, and even collecting Box Tops for Education along the race course, he’ll have his engine revved when the big day arrives. Have you forgotten about collecting Box Tops this summer? Don’t worry because there are plenty of daily essentials available at Walmart that have DOUBLE BOX TOPS! Stock up on select Kleenex multi-packs, Viva paper towels and Scott bath tissue at Walmart, and earn double Box Tops. 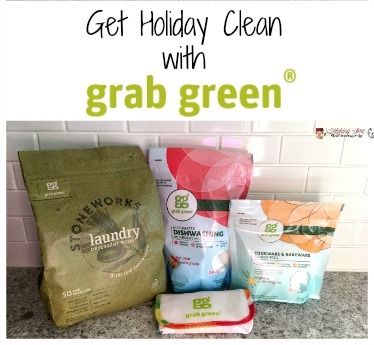 There’s no better time to stock up on these everyday household essentials! And since school is starting you’re going to need them anyways. Knock on wood, but it’s almost cold season and you’ll likely get lots of use out of those Kleenex. And just imagine all the kids who will be in and out of the home to work on after school group projects. Not to mention the sleepovers and hangout sessions. Talk about a ton of messes and bathroom usage! You’ll go through all the paper towels and bath tissue before you even know it. New to Box Tops like we are and don’t really know what they’re about? 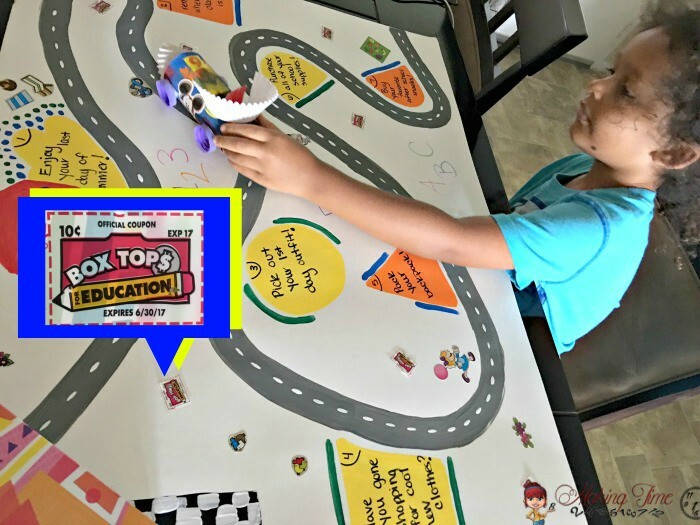 Box Tops for Education has been helping schools across the nation acquire books, computers, playground equipment and so much more, since 1996. 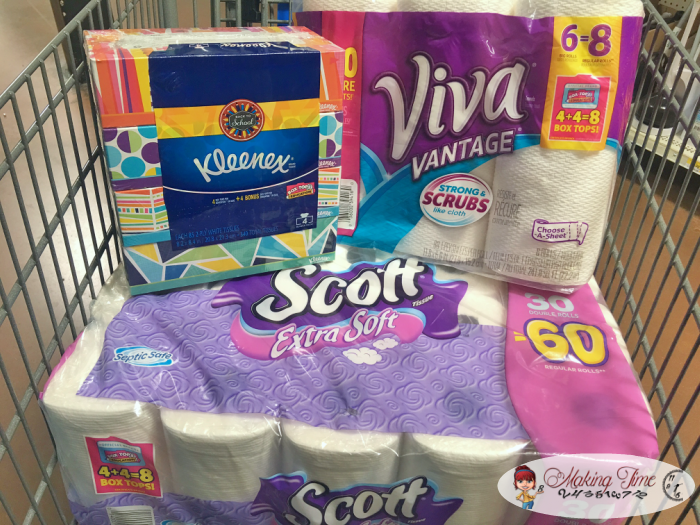 Box Tops can be found on a large variety of products, just like some of these select Kleenex, Viva and Scott products at Walmart. In fact, if you look in your pantry right now I’ll bet you’ll find at least 1 Box Top, if not multiple! All you have to do is clip them and submit them to your child’s school. Each Box Top is worth $0.10 (double with these particular Kleenex, Viva and Scott products) and the school can use that money to purchase the things it needs. It’s a win-win for everyone! You stock up on the daily essentials you need at home and your child’s school gets extra money to help purchase items that make his educational experience that much better and fulfilling. So how about that super fun Race to the 1st Day of School? 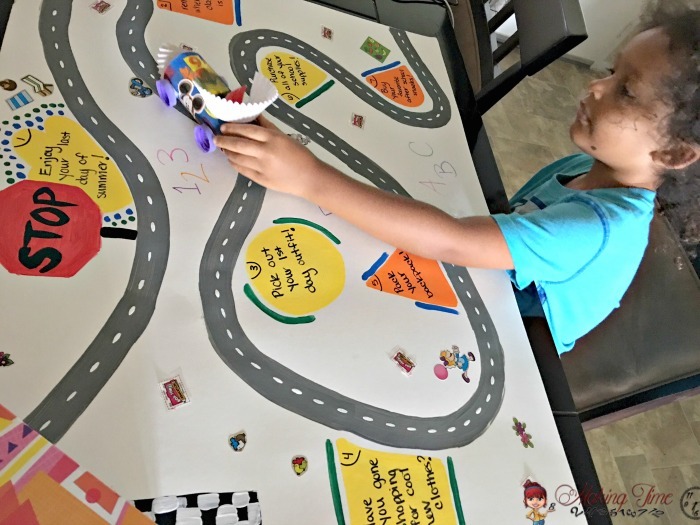 I put together this cute little “race track” for my son to use throughout the week right before school starts. It’s basically a 7 day countdown and each day there’s a reminder for him that’s related to preparing for the first day of school. As he moves through the race course, I’ve “hidden” Box Tops along the route that he can collect for his school. I took these Box Tops right off the daily essentials I purchased from Walmart. Not only that, but we even used some of the products to help create our race track. 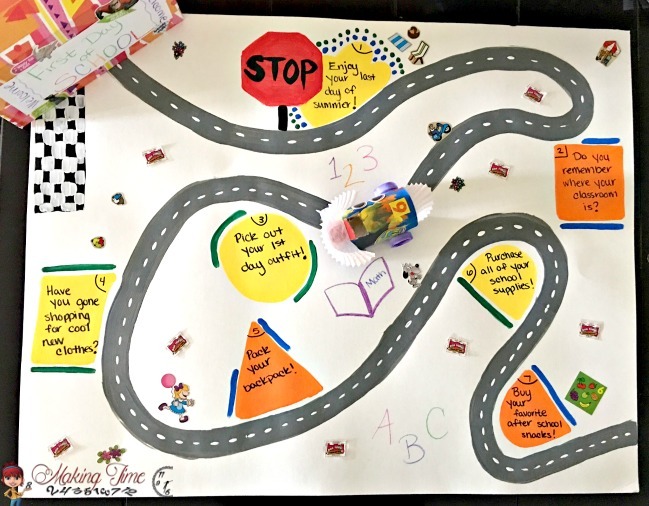 Want to make your own Race to the 1st Day of School? Here’s what we did. 1. Design your race car. What’s a race without a race car? 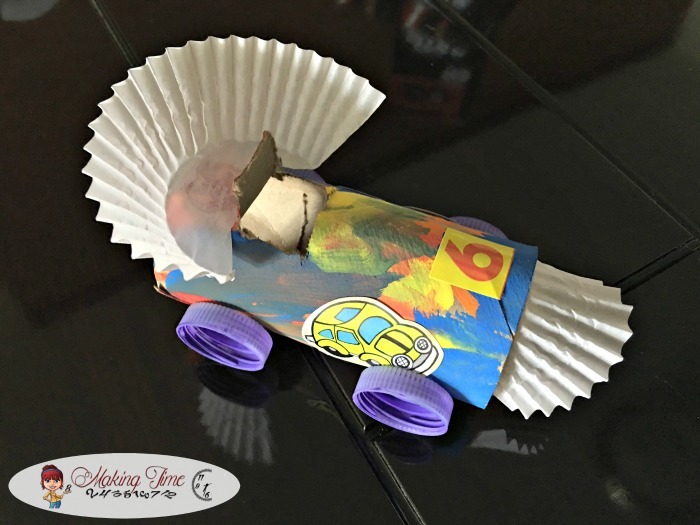 I gave my son an empty Scott bath tissue roll, some paint and a paintbrush, some stickers and 4 water bottle caps for wheels, and let him have creative freedom to design his race car. He did his thing and started by painting his race car. He was pretty excited about his race car so it was pins and needles for him as he waited for the paint to dry. Next he added a few stickers, and then I helped him glue his wheels on. We even added a spoiler and front bumper using a cupcake wrapper. 2. Create a race track. While my son was designing his race car, I got to work on creating a race track for him to race his car on. All I used was a poster board, some paint, stickers, crayons and a black Sharpie marker. 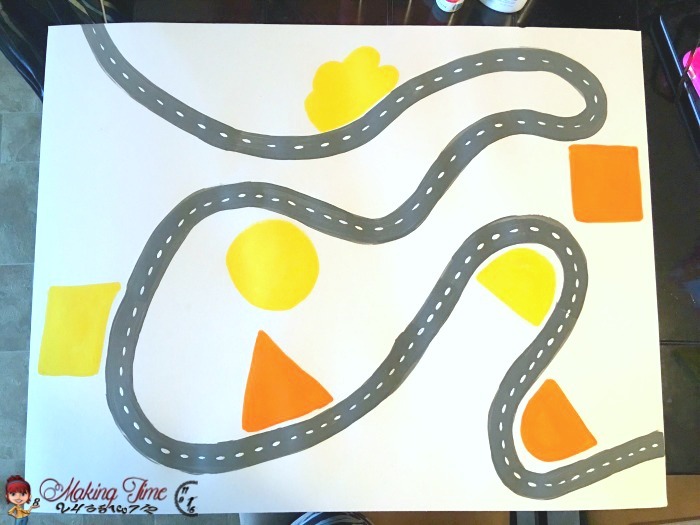 I started simple with a road and then created 7 stops for the race. It’s a race and in this case, a 7 day countdown to the first day of school. At each stop there’s a reminder or task for him to complete, all of which help prepare him for his first day of school. You could easily do more than 7 days, but I’m really hoping to get his little engine revved during the week right before school starts. 7 days to go: Buy your favorite after school snacks! 6 more days: Purchase all of your school supplies! 5 days left: Pack your backpack! 4 days more: Have you gone shopping for cool new clothes? 3 days away: Pick out your 1st day outfit! 2 days to boot: Do you remember where your classroom is? 1 day and done: Enjoy your last day of summer! After I had all the basics down, I started adding little details with drawings and stickers. And let’s not forget about collecting Box Tops! I took the double Box Tops from my Kleenex multi-pack and used a simple dot of glue to place them throughout the track. As my son races through the week and makes his daily reminder stops, he can get into the habit of collecting Box Tops for his school by collecting the ones I’ve placed throughout the race. Since I used just a small drop of glue, they’re super easy to pull off the poster board and it doesn’t ruin the Box Tops. Can you find the hidden Box Tops? Last, but not least, your child needs to have a finish line and prize. And what would that be for the Race to the 1st Day of School? It’s the first day of school, of course! If you haven’t already, add a finish line to the race course. I had already added mine, but then using a Kleenex box, which was already super cool and colorful by itself, I added a little more flare and designed a welcoming schoolhouse. 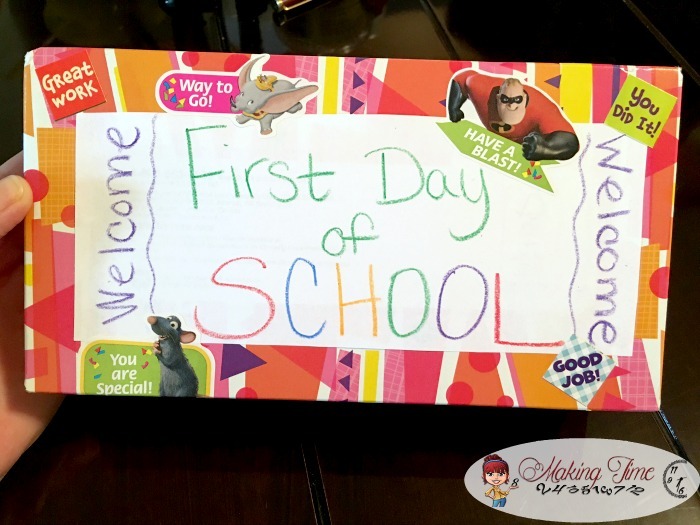 I created a banner of sorts welcoming kids to the first day of school and glued it onto the Kleenex box. I then used stickers that I had on hand that just so happened to be very fitting for the finish of the race. With phrases like “Way to go!” and “Have a blast!,” the stickers I had were perfect for finishing a race and heading into the first day of school. My son is really excited about the first day of school and has been playing with his race track since we made it. He just couldn’t wait even though school doesn’t start here until August 22nd. He’ll definitely be prepared when the big day finally rolls around, double Box Tops for Education in hand and more! How are you sending your kids back to school with Double Box Tops from Walmart? 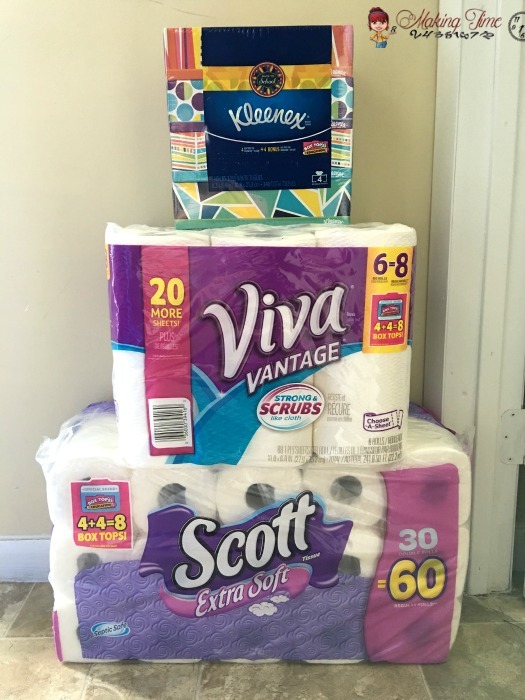 *Thank you to Kleenex, Viva and Scott for sponsoring today’s post and inspiring me to get prepared for Back to School. This is a sponsored post in which I will receive compensation. My opinions are 100% my own and in no way influenced by the brand. Any claims or statistics should be confirmed with the brand. Please see this blog’s full policies and disclosure here. I love the race car and race track. I will have to start saving the box tops for my nieces school. Box Tops is a great program. 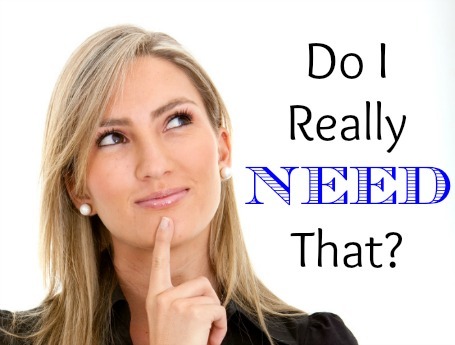 Schools don’t necessarily get enough funding for what they need. I wish we had this program in Canada. I really can’t believe we are already looking at back to school!!! My kids love to collect box tops its a great way to raise money for schools. Box tops are great. Can’t believe it’s almost school time! I love the race track idea. So cute! We collect box tops too – it’s a great way to give back to our local schools. I love the box top program. It’s such an easy way for everyone to help their local schools. I wish everyone would save their box tops. I’m so not ready for back to school lol! I love your idea here. So creative! 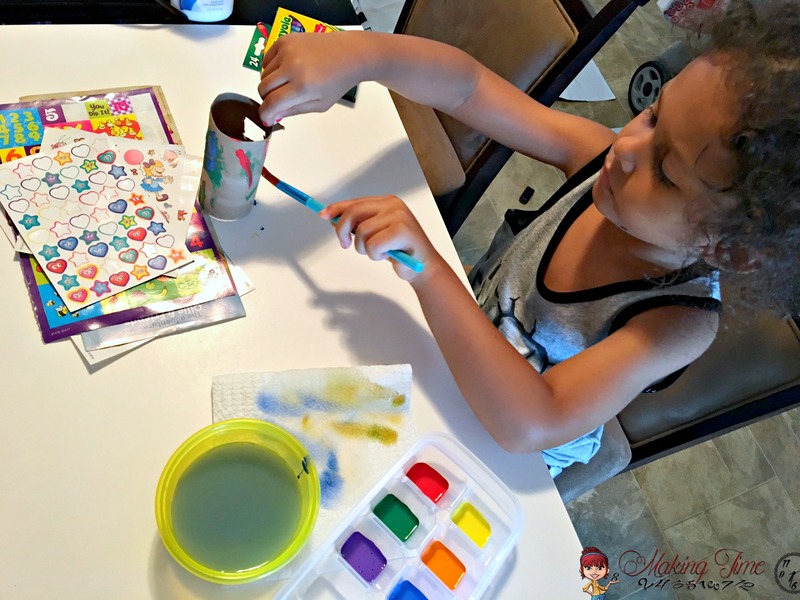 Adorable crafts! I love the race car and race track..Box tops are great. Can’t believe it’s almost school time!. I have collected for my kids for many years now and they look for box tops every time we go shopping. oh my gosh, I need to make this chart. 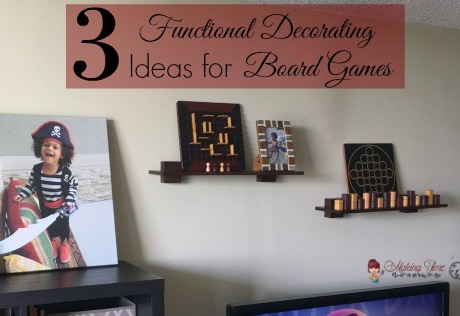 It looks amazing, totally something my daughter would love! I love boxtops for education; it’s such a wonderful program. 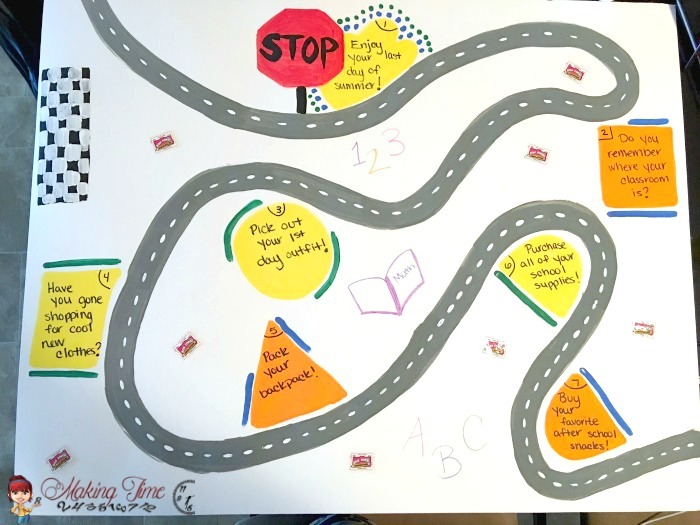 Your idea is such a fun way to get prepared for the school year, too! I’ll definitely try it out with my youngster! Both my children collect box tops for school. It was such a fun time for us preparing for back to school..now we prepare for college! The Box Top program is such a great way to help out our schools. My son is always collecting box tops. I will have to head over to Walmart and pick up some of these products. Box Tops is a great program.